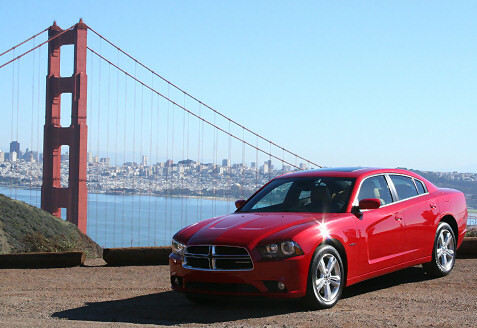 I was invited by Chrysler to join other bloggers in San Francisco for the opportunity to drive some of the new Dodge vehicles. As you can see from the photos above, we had a beautiful day in the city by the bay, and I had a great time with this impressive new lineup. The Dodge Charger is the flagship vehicle for the Dodge brand, and the Charger has been completely redesigned from the ground up for the 2011 model year. The iconic feel of the vehicle remains, but you can see the new, sleeker design in the first photo above and in the other Charger photos. It offers a sport sedan that I think will have huge appeal for guys looking for performance, aggressive styling and value. The car was a joy to drive through the winding roads in the Bay area, as the new suspension lived up to the promise. For a car that starts at $25,995, buyers will get tremendous value. The real treat of the day was the 2011 Dodge Challenger. I had the opportunity to drive one of the Inaugural Edition versions of the 2011 Challenger SRT8 392. This car is beautiful as you can see from the slideshow above, with the white paint and the blue racing stripes, and it’s the ultimate American muscle car. Frankly, I can’t remember a car I enjoyed driving more than this one. The car is a torque monster – the 392 Hemi is rated at 470 horsepower and 470 lb-ft of torque. I drove the automatic version, and this car is a beast! When you hit the gas at any speed, this car does exactly what you want it to do as it respond with a muscular roar. It handles beautifully as well, and any car enthusiast will fall in love with this 2011 Challenger. While the Challenger and Charger stole the show, I was equally impressed with the other vehicles in the Dodge lineup. Dodge brought back the Durango, and this full-size SUV should be a real hit. The 2011 Durango has all the luxuries customers are becoming accustomed to in the crossover segment, but this SUV is the real deal as it still leads its class in towing capacity. Meanwhile, the handling is much better than previous versions of the vehicle, so you don’t feel like you’re driving a big truck. In the crossover segment, the 2011 Journey should do very well in this exploding segment. Many in our group were impressed with how this car drove, and Dodge added some nice features including optional third-row seating that folds up or down depending on your needs. It’s a nice feature for families with young children. In all the vehicles, Dodge has placed a new emphasis on the interiors and it shows. The goal for the brand is to over-deliver and provide real value for the cost of a vehicle, and you’re finally seeing Dodge live up to that promise. I loved the interior in each of the vehicles, and I think customers will feel the same way once they test drive these cars. After San Francisco we joined the Chrysler team as they unveiled their new vehicles at the LA Auto Show where we had the opportunity to join in on a round-table discussion with Dodge CEO Ralph Gilles. Ralph is a true car enthusiast and you can see the passion he has for the new lineup. Check back as we’ll be publishing full reviews of each of these cars, but I would recommend that you take the time to drive them. Each of the Dodge cars combines muscular styling with an impressive driver experience, and I suspect many drivers will be pleasantly surprised as they rediscover this brand.